There's something very pompous about the basic pitch of this movie that slowly chews away at its core, feels Sreehari Nair. If anything, Mercury will make you realise how good Nila Madhab Panda's Kadvi Hawa was. Although man's greed and the destruction he spreads is the theme that binds the two films, Mercury reduces it to sentimental diddling and a mishmash of literalisms and forced symbolisms. 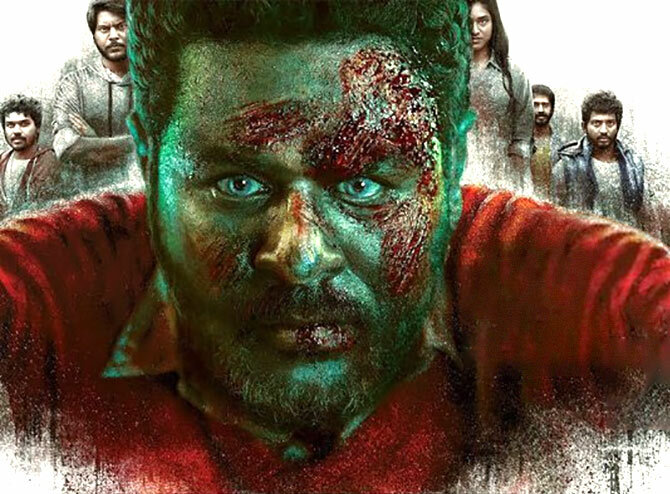 Without anything like the intensity of Kadvi Hawa or its lyric passages, Karthik Subbaraj stages Mercury as a thriller about five spiritual offenders and closes the film with a grand exercise in aesthetic purification. Those who dig the harmless kicks that thrillers provide may end up in a huff; might complain that under the pretext of a genre movie, they were treated to a show of self-conscious miming. And those with a tolerance for ‘messages’ may read Mercury as a parody of the standard socially conscious movie. Subbaraj clearly cannot have it both ways: he's planning a candlelight vigil inside a toxic factory. Not recommended, sahib! The overarching concern of Mercury is Corporate Greed, but the marketing of the movie throws the game. For this is not a Silent Thriller as the Press-Kit claims: there's music here that alerts you to whatever precise emotion you must feel at any given moment and there are sound effects. Moreover, for a movie that so defiantly claims to be ‘Silent', there’s hardly anything diegetic to be heard. Violin notes signify static time. The mouth organ pipes in despair. Industrial sounds accompany the red-sweatered, blue-eyed, lungi-clad zombie figure played by Prabhu Deva. And completing the band is a ghost-sensing deer who in a moment of transcendence... burps! A dialogue-less movie is what it actually is, but mechanically engineered. There's nothing that feels sourced from life; not the acoustics, not the visuals. There are hardly any shots that offer you a real sense of place, but if you want plays with shadows, sure, Karthik Subbaraj will arrange it for you. He's a trickster, this Subbaraj, a Yuppie who wants to tell us how shallow Yuppiedom is. He has the schoolboy gush of someone who wants to create something avant-garde, but cannot think beyond a story framework that's now open range for a thousand slasher films: A group of the Young and the Careless who accidentally kill someone,and who, in their turn, are killed, one after the other, mercilessly. (We all know what they did in 1997, Subbaraj Sir). The young gang of five, four boys and a girl are deaf and dumb, and they share a chemical connection with a blind avenging angel played by Prabhu Deva. The kids piss Prabhu off really bad one night, there on a high-range plantation road, and he goes after them in full Kabuki mode. Interestingly enough, their respective disabilities become their swords and armors when the gang of five faces up to the avenging angel inside an abandoned factory, which factory was in the past a site of mercury poisoning -- the Auschwitz of this allegory. The core idea that chemical disasters born out of corporate negligence are tragedies in a state of continuum is definitely something fresh. But like all executions less divine than their conception, Mercury, crippled by Karthik Subbaraj's ponderously artistic approach, explores into dead ends. Are Subbaraj's young nutties, just carousing innocents or are they also something more: say, stand-ins for the worst players in capitalism? Subbaraj's storytelling suggests both possibilities, and this diminishes the power of the allegory. These five are surely not completely devoid of moral sense; but then what do those repeated shots of an Uncle SamDoll in their vehicle imply? Most importantly, what is the point of making the movie dialogue-less if characters share back-stories with one another by osmotic telepathy while we in the audience are conveyed the same back-story using a hackneyed cinematic device like the flashback? There's something very pompous about the basic pitch of this movie that slowly chews away at its core. Prabhu Deva is an interesting choice to play the avenging angel; cast against type. However, the deliberate gracelessness in his character's design hints at unexplored possibilities; for a Prabhu Deva who would have retained his buoyancy and comic eccentricity in the face of his murderous rage would have given this material a special style. He could have been India's Bloody Beetlejuice, while here he merely stays put as our homicidal Gerald Mcboing-Boing, speaking only in grunts, purrs and hisses. Karthik Subbaraj's talents seem better utilised when they are at the service of the genre and not pressed into making points. In fact, for the most part, the ‘thriller elements’ in the movie and its ‘messages’ just don’t coalesce; it’s not going too far to say that they cancel each other out. It's s when he has to build tension and not necessarily diffuse it, that Subbaraj shows off his true mojo. In a scene of the five friends carrying Prabhu Deva's body deep into the forest, the setting looks eerily like the Birnam Wood descriptions in Macbeth. Plus, there's a sense of geographical displacement that hang around certain frames: like a leafless tree captured in the middle of a thick plantation. The movie's most sustained burst of imagination occurs when cinematographer Tirru uses the empty space inside the factory to heighten the anxiety in a scene; this, even as the camera swings from a face on the verge of misery to a face on the verge of cannibalistic exhortations. It's in the most cinematically inspired moments that Karthik Subbaraj is at his most relaxed; quite clearly, his deepest emotional experiences aren’t drawn from life but from the movies. And so, when, beside the closing credits, appeared the text 'Dedicated to all victims of Corporate Greed,' it hit me more like an executive choice of words than a genuinely felt hymn. Who's to tell Karthik Subbaraj that Corporate Greed has more than one face; who's to tell the producers of Mercury that categorically asking critics who had come for the movie's Press Show to not reveal the 'twist' when composing their reviews is also one form of Corporate Greed? Or is this critic being unnecessarily grouchy? A final word on the acting of the five young nutties; for it is hugely indicative of the Tamil Industry’s talent for cashing every emotional cheque at hand. In the way the guys approach their roles, one can never be certain if they know the difference between playing it mute and acting like imbeciles. Deepak Paramesh, who essays one of the five, magically, looks possessed right from the start; as if the mercury went straight into his adrenal glands. The best of the lot is the girl, Indhuja, who scores her effects by looking blandly beautiful and distant. She's held-back -- wondering, it seems, what the devil she is doing in this godforsaken plantation. So remote is she at times that she’s almost opaque. And yet, it is she who fits right in there. That must tell you something: this is a ghost movie where the spiritless reign.